Jospin is a 13-year-old boy living in the Kaga Bandoro Internal Displacement Camp in the Central African Republic (CAR). He came here almost four years ago by foot with his mother, father and seven brothers and sisters. 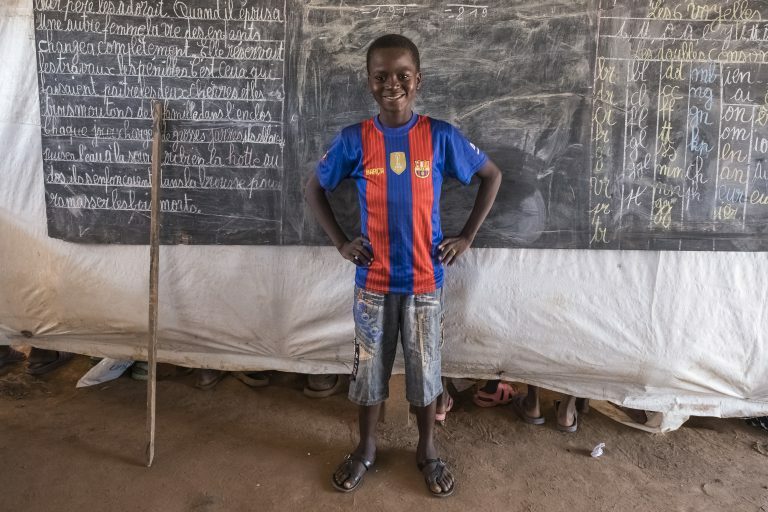 Like many of the 680,000 people who have been displaced by wide-scale uptick in violence in CAR, Jospin had never been to school. Now with support from Education Cannot Wait, and the backing of a broad international coalition that includes the Norwegian Refugee Council, INTERSOS, UNICEF and Plan International, Jospin is in school and hopes one day to become a doctor. The new Kaga Bandoro school, supported in part with funding from Education Cannot Wait, has 11 classes and 1,675 registered children. All the 11 teachers are themselves displaced and live on the site. “I teach 80 children in the 4th year of primary school. Now I see that many of these children have become advocates for their friends, they convince the parents to send the children to school,” said 52-year-old widow and mother of five, Elizabeth, who was displaced over four years ago and now works as a teacher in the Kaga Bandoro school. Despite this progress, huge challenges remain. With the constant displacement of populations due to insecurity in the region and a steady flow of refugees and internally displaced people, resources are stretching thin in Kaga Bandoro’s school. On a recent Education Cannot Wait mission to the school, more than 80 children were in attendance in one of the temporary classrooms, which only had 40 children just the week before. Recent estimates from UNICEF indicate that more than 357,400 children lost access to education, health and protection services due to the violence and protracted crisis in CAR. To date, Education Cannot Wait’s initial US$6 million allocation has reached an estimated 65,000 children, 31,000 of whom are girls. The support in CAR extends across a broad range of activities, designed through local engagement, to build lasting solutions to one of the world’s most significant education crisis today. The funding from Education Cannot Wait is working to provide a range of formal and non-formal education opportunities for out-of-school children in the central and northern areas of the country. Coalition partners are also implementing specific interventions focused on early childhood education, as well as youth-focused activities that incorporate basic literacy and mathematics alongside vocational and life skills training. In addition, both UNICEF and INTERSOS are focusing on the quality of education by providing materials to both children and teachers, and building local technical capacity to provide education in emergency contexts. The Norwegian Refugee Council also implemented a successful “Accelerated Learning Programme,” allowing primary school children to catch up on schooling missed due to their displacement. Building on these initial results, Education Cannot Wait is now focusing on kick-starting a new multi-year programme that will provide sustained support for education in emergencies in CAR. Discussions are underway with high-level government officials to outline the immediate needs for support, also connecting with a variety of stakeholders, including UN representatives, NGOs, and boys and girls whose lives have been uprooted by crisis. “The development of the Multi-Year Response Programme is already serving as a resource mobilization tool with potential funding being discussed with key donors, including the European Civil Protection and Humanitarian Aid Operations department (ECHO) and the Central African Republic Humanitarian Fund, building toward a goal of mobilizing some US$75 million for the three-year programme,” said Education Cannot Wait Senior Advisor Graham Lang, after a recent mission to CAR. The education system in CAR faces structural challenges that can only be addressed through multi-year programming connecting practical on-the-ground work to build schools, provide supplies and fund teachers, with longer-reaching policy and support programmes to build capacity, improve teacher training and create the enabling environments required for long-term sustainability. It will be an uphill battle in CAR. Prior to the crisis only 67 per cent of children were attending school, and in 2009 it was estimated that only 35 per cent of the population was literate. Elizabeth has already taken on the battle: “We have the responsibility to teach these children and make sure they do not become bandits. If they do not go to school, what will become of them?” she says. “Through sustained and more collaborative efforts among donors, humanitarian and development aid actors and with the Government, this is a fight we must win, as the future of an entire nation is at stake,” said Lang. Education Cannot Wait is the first global fund dedicated to education in emergencies. It was launched by international humanitarian and development aid actors, along with public and private donors, to address the urgent education needs of 75 million children and youth in conflict and crisis settings. ECW’s investment modalities are designed to usher in a more collaborative approach among actors on the ground, ensuring relief and development organizations join forces to achieve education outcomes. Education Cannot Wait is hosted by UNICEF. The Fund is administered under UNICEF’s financial, human resources and administrative rules and regulations, while operations are run by the Fund’s own independent governance structure.